To introduce Chicago’s Goose Island Beer Company beers to Seattle, Quinn’s and Goose Island Brewmaster Greg Hall hosted a private event at the Sole Repair event space last Thursday. 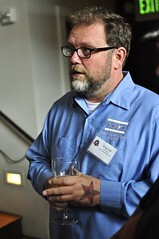 Hall presented three Belgian-style ales paired with delicious appetizers from Quinn’s Executive Chef Scott Staples. Named for Greg Hall’s daughter, Sofie is his take on a Belgian farmhouse ale, featuring pilsner malt and amarillo hops. During the brewing process, a small percentage of the beer is removed and put in oak barrels with orange zest, then blended back into the base beer. Brettanomyces is also added during secondary fermentation. Inspired by Orval, Matilda is a Belgian-style Pale Ale named for the Countess of Tuscany, whose ring is featured on Orval’s logo. As with Orval, Hall adds Brett during secondary fermentation. He describes the beer as having flavors of spice, fruit and funk. Pere Jacques is a Belgian-style Abbey Ale or Dubbel that was inspired by the beers of Rochefort and named for that brewery’s Abbot. The beer has rich malt and complex yeast flavors. I enjoyed all three beers and went back for seconds of Matilda (which is on tap now at Quinn’s). It may not be quite as complex and delicious as Orval, but it’s got a lot of flavor. Sofie has a refreshing quality that is good for summer, and Pere Jacques is a sipper that makes sense as a dessert beer. Meanwhile, Quinn’s supplied information sheets suggesting which appetizer to pair with which beer. I’m not usually much of a meat eater, but at these sorts of events, I’m an opportunistic omnivore. I just kept eating everything that came out of the kitchen (except for the foie gras). My favorites were the smoked salmon on corn blinis with crème fraiche and chives, the Moroccan-spiced shrimp skewers and the caramelized onion tarts with bacon and Stilton. Overall, it was a fun event with good beer and great food. Brewmaster Hall mentioned that Goose Island wisely decided to bring their Belgian-style beers into the Seattle market instead of more familiar beers like the IPA since Seattle already has so many good local IPAs. They hope these beers will appeal to a wide variety of beer drinkers as well as non-beer drinkers. 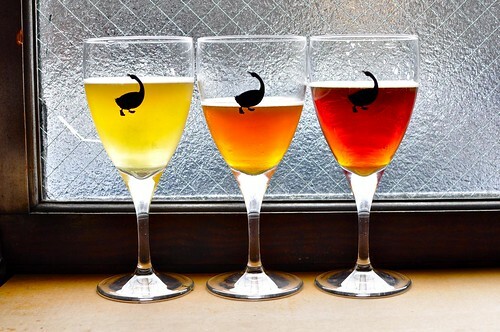 Hopefully we’ll see Goose Island’s other Belgian-style beers like Fleur and Juliet in Seattle soon. Check out the rest of Russ’ photos from this event on Flickr. Ed and Vivian are big fans of the Goose but I have yet to try any. I almost ventured forth into the unknown Goose territory at the Brewers Festival but I decided to stick with the Washington brews. I’ve been enjoying the Matilda. It’s a bit pricey but I’ve been on a multi-year search for it so I can’t complain. The Pere Jacques and Sofia were both tasty as well. Hope to see more GI beers trickle into Seattle.